Packaged baked tofu is the vegetarian equivalent of rotisserie chicken. You can buy it and do about a gazillion different things with it. Yes, a gazillion. I’ve counted. Throw a slab of it on a bun and top it with slaw, cube it and put it in salad, add it to a veggie stir fry, eat it as-is–it’s so versatile! Back in the day, before this whole food blogging thing, I used to always keep a package or two in the fridge for quick dinners when I didn’t feel like cooking. I had the idea to do this Peanutty Quinoa Bowl recipe with store-bought baked tofu, but then I forgot to buy it. It actually wasn’t my fault–Whole Foods keeps moving things around and the baked tofu wasn’t where it used to be and when it wasn’t in its usual place, I was totally thrown off and forgot about it. Oops! Driving all the way back to Whole Foods for a package of tofu seemed silly, so I thought, hey, I’ll make my own baked tofu! This recipe is similar to my Baked Barbecue Tofu, but the whole barbecue sauce thing can be a little bit limiting. Do you want barbecue sauce in your stir fry or salad? Maybe not. If you’re still skeptical about tofu, try it baked–really, I think you’ll change your mind. It’s marinated so it’s flavorful, not bland. Using a tofu press helps the tofu absorb as much of the marinade as possible. Baking it makes it chewy, not mushy. 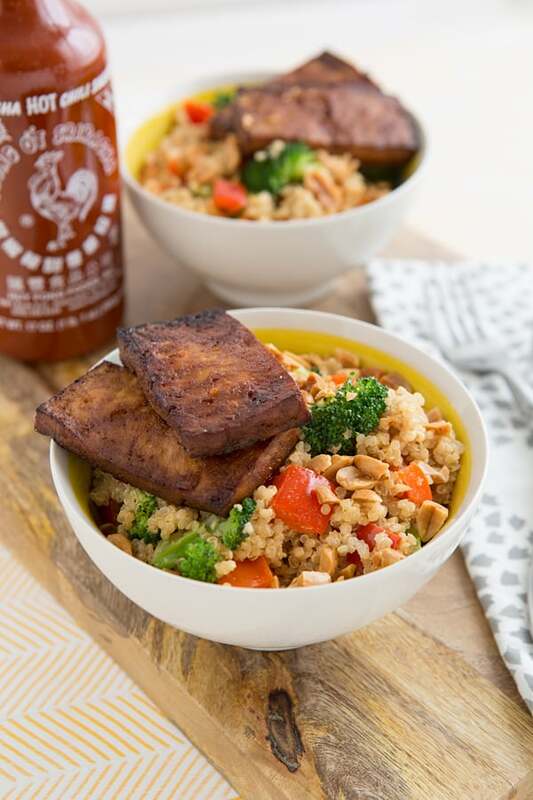 Barbecue tofu is awesome, but this baked tofu recipe has a savory Asian-inspired flavor that makes it work in a variety of dishes–stir fries, salads, and especially Peanutty Quinoa Bowls. Peanutty Quinoa Bowls? Yes! These are so easy. You toss some quinoa and some veggies with peanut sauce and serve it with a few slices of baked tofu (either homemade or store-bought). You can do this! This recipe makes two servings; if you’re not sharing, throw the second bowl in the fridge and eat it tomorrow. 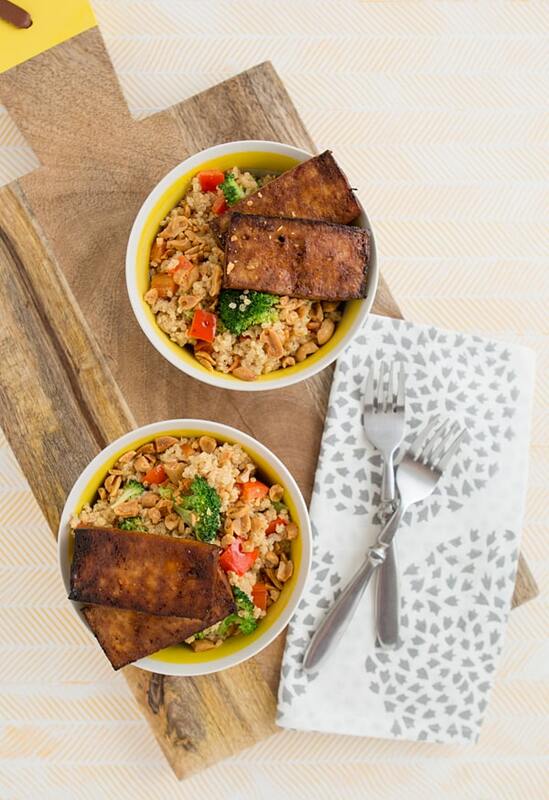 Quinoa and veggies tossed with homemade peanut sauce and topped with baked tofu. Cook the quinoa in water or vegetable broth according to package directions. While the quinoa is cooking, heat the olive oil in a medium skillet over medium-high heat. Add the red pepper and cook for about 3 minutes, until softened. Transfer to a large bowl. Add the broccoli to the skillet with 2 tablespoons of water. Cover and steam for about 2 minutes, or until the broccoli is tender. Transfer the broccoli to the bowl with the pepper. Whisk the peanut butter, lime juice, water, tamari, sugar, and ginger in a small bowl. When the quinoa is done, transfer it to the bowl with the veggies and toss everything with the peanut sauce. Season with salt and pepper to taste. Divide the quinoa into 2 bowls, then top each with 2 slices of tofu and a tablespoon of chopped peanuts. This marinated baked tofu is the perfect addition to stir fries, salads, and veggie bowls. Whisk together the tamari, maple syrup, olive oil, garlic, and pepper in a small baking dish. Place the tofu in the dish and let it marinate for about 30 minutes, flipping the tofu over after about 15 minutes. The tofu should soak up almost all of the marinade. Preheat oven to 400ºF. Spray a baking sheet with oil or cooking spray or line it with parchment paper; place the tofu on the baking sheet and bake for about 40 minutes, or until edges are dark and tofu is chewy, turning tofu over halfway through cooking time. Oh My Veggies Reader Survey: The Results! What I Ate This Week | Pumpkin Bread and Apple Nachos! Because it's fall. I made this last night for my dad with a couple of changes (we are not vegetarians and he is concerned about soy consumption, so I actually topped it with shrimp, not tofu, and I had cauliflower, not broccoli) and I just want to say it was very very good. I had doubled the recipe to make sure there was enough and allow for leftovers, and there still weren’t any! Your peanutty dressing is so good I think I’ll try it on lettuce as a salad. Oh my goodness! I made this yesterday for my lunch today & this week. It. Is. AMAZING!!! I have never enjoyed tofu before (and I didn’t even have a press, I just used paper towel) and I LOVED this tofu. The peanut dressing is totally amazing on the quinoa and vegetables. I’m just in love with this dish all around. Thank you so much for a wonderful new vegetarian meal! So excited to try this! 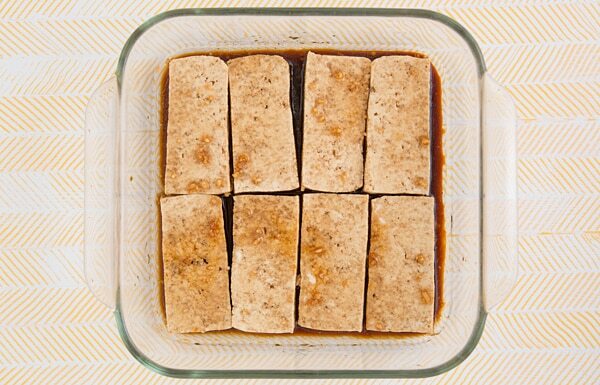 Did you know that freezing tofu (after pressing and slicing) helps it to absorb marinade? Even 30 minutes in the freezer does the trick! I really wish the tofu recipe was listed first. I’ve made this twice and forgotten both times that the tofu takes twice as long as everything else. Otherwise, I LOVE this meal and so does my family. It is a delicious recipe – I love it! But true, putting the baked tofu recipe below which takes over an hour messed up my timelines totally. It would be nice if the recipe instructions started with tofu prep, and while it bakes, the quinoa and veggie prep could take place. In any case, still a totally delish meal!!! I’ve just discovered your site whilst doing a search for cauliflower rice! I was veggie for 18 years and whilst I’m not any more, I still love veggie food and am so excited to find your delicious recipes! Can’t wait to give some a try. i made this tonight & it was amazing! The only thing I did differently was add some matchstick carrots. Thanks for posting this; the peanut butter was perfect in the sauce & the tofu was excellent! That looks so delish. I am going to make this for my family today. What a great healthy recipe. Thanks again. Could you slice the tofu BEFORE pressing? Hi Gina, Yes, you could slice before pressing. It may bake faster, though, so you’d just need to watch it to make sure it doesn’t burn or dry out! how much protein for 1 serving? Hey! This recipe looks great, by the way, and I plan on trying it tonight! If I substitute tempeh for tofu (we ran out) how long would I bake it for? I made this as a stuffed roasted pepper instead (because I was too tired/lazy after the gym to chop-up the pepper), best thing I’ve eaten for a long time so going into meal rotation in my house. Thanks! I love the look of this recipe and hoped to print it out so I could keep it on the kitchen counter while cooking. Aren’t your recipes usually set up to click for a printable view of the recipe? The print button is back on desktop – we were having a little trouble with it. We’re working on getting it back on mobile too! I made a double batch last week to last me but my husband who’s the pickiest person I know decided he loved it and it was gone quickly. so im making it again this week it was so yummy. The peanut sauce really adds a great flavor. I kept the sauce separate and added it as I ate it. We went through the sauce fast so I would suggest making a lot of it. wow.. baked tofuss , really loved the recipe.. iam going to try this out. thanks for sharing the recipe.. the pics are awesome.. keep on doing.. thank you..
Where has the tofu recipe gone? Had this page saved to my favourites and now it’s disappeared! Apologies! We just did some work on the site and are having a few issues. We will get this fixed as soon as possible! Ahhh! I love this recipe and come back to it all the time. But the baked tofu recipe is still missing! Help! I need tasty tofu! Waaaaa! I can’t find the tofu marine recipe! I use that sauce nearly every week, and it seems to just be MISSING!? Help! Please! We love to! Olive oil, maple syrup, soy sauce, garlic, salt and pepper (I add crushed red pepper for a tiny bite) bit how much?! Thanks for the help! Help! I can’t find the baked tofu recipe. Ive made this twice so I know it was there before. Can’t seem to find it this time. Peanut + quinoa for life!